Our Lady under the title of Our Lady of Prompt Succor came to New Orleans in 1810 under extraordinary circumstances. Over the following two centuries, the Ursulines of New Orleans have shared devotion to Our Lady of “quick help” with all who seek the efficacious intercession of the Mother of God in moments of pain or need, joy or thanksgiving, or simply out of desire to live their lives day after day with deepening fidelity and love. 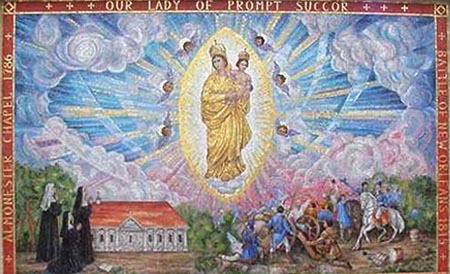 A well-known intervention of Our Lady of Prompt Succor concerns the Battle of New Orleans, January 8, 1815. During the night of January 7, Andrew Jackson and his relatively small, little-prepared and ill-equipped band of soldiers organized their defenses against the large, very well equipped British army which would attack the city before dawn. At the same time, many citizens not directly involved in the army joined the Ursuline Sisters in an all-night vigil in their chapel on Chartres Street, imploring Our Lady of Prompt Succor to give the victory to Jackson for the United States, saving the city of New Orleans from British control. During the night, the Superior promised Our Lady that if Jackson and his men won, a Mass of thanksgiving would be sung every year in memory of her saving help to the city on that day. As dawn was breaking, Fr. DuBourg began a Mass for the same intention. At the very moment of the Communion a courier rushed into the chapel announcing that Andrew Jackson and his men had won the victory, and the Mass ended with the joyous singing of the Te Deum. A Prayer to Our Lady of Prompt Succor: Our Lady of Prompt Succor, hasten to help us. (three times). O Queen of the Universe, Our Lady of Prompt Succor, sovereign full of kindness, you are the advocate of sinners, a haven of safety to the shipwrecked; you are the resource of the world, the ransom of captives, the health of the infirm, the consolation of the afflicted, the refuge and salvation of all on earth. We beseech you to grant us the help of your prayers, which incline our Heavenly Father to forgive our sins and grant our petitions in all the necessities of this life, prayers which obtain for us an abundance of graces to receive the pardon of our faults and arrive at the practice of virtue, prayers which stop our enemies, confound their designs, and triumph over their efforts. Amen. Such a wonderful history! It makes grow my confidence in Our Lady and in the Divine Mercy. I prayed that prayer too. Precious and very helful prayer!